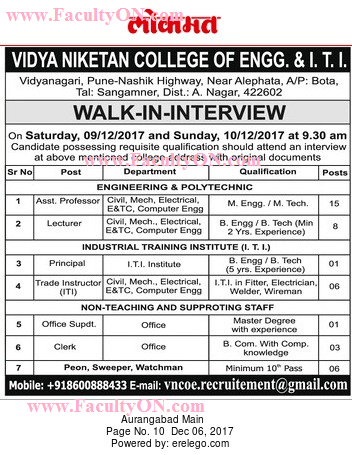 Vidya Niketan College of Engineering, Ahmednagar has advertised in the LOKMAT newspaper for the recruitment of Lecturer / Assistant Professor jobs vacancies. Interested and eligible job aspirants are requested to walk-in on 09th and 10th December 2017. Check out further more details below. College Profile: The Vidya Niketan Global Institute’s College of Engineering, has been established as the first Engineering College along with the Pune Nashik National Highway. The institution owes its foundation to the bold and inspired vision of Qualified Professors and high visionary Directors.